Keen for a quick rip through the desert sands in an exceptionally powerful Dune Buggy. Pace and performance keep you fully inclined to keep coming back for more. 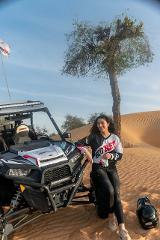 Experience the desert landscape at sunset whilst ripping up the dunes in your Polaris 1000cc XP RZR. This adrenaline filled ride is for anybody looking for something truly extraordinary. 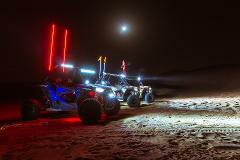 2 hour Polaris buggy drive through magnificent dunes followed by a desert Bedouin campsite luxury dining experience. Great entertainment, sheesha, henna, buffet meal and belly dancer. As the need for extreme adventure in human nature becomes more apparent day by day we have created a product for you to explore the depths of your own adrenaline. 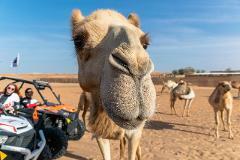 We often find ourselves wishing we had time to ride a quad and a dune buggy but cant ride both - solved! take a 1 hour buggy tour followed by a 1 hour quad tour - same guide, same day :) this option costs far less for both individually.